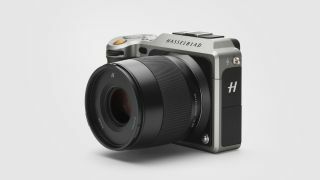 As if there was any doubt that this is the season for new cameras, a recently spotted registration at the Bluetooth agency points towards yet another: Hasselblad medium format camera – and a successor to the Hasselblad X1D-50c mirrorless 50MP model. First reported by Mirrorless Rumors, the registration was published in late December. The only information contained in the filing, aside from obscure code numbers, is “This is a Camera with Bluetooth”, which obviously doesn’t reveal many clues. However, the rumor site predicts that the new camera will use the same 101-megapixel / 4K 30p Sony sensor as the upcoming Fujifilm GFX100S, which is expected to go on sale in early 2019 for $10,000 and boasts such features as in-body image stabilisation (the first medium format camera to do so). Could this therefore be Hasselblad X1D-100c in the making? If they do indeed share the same sensor, it will be interesting to see how Hasselblad positions the price point of its new camera. Its predecessor, the 50MP mirrorless Hasselblad X1D-50c (pictured top), retails for £5,999 / $7,995, while the company’s current 100MP model, the H6D-100c Medium Format DSLR (pictured above), retails for £31,080 / $32,995. Mirrorless Rumors believes that the camera will be announced in the next couple of months, and the original X1D has just been listed as discontinued at B&H, so it looks like we won’t have to wait long to find out.